For the most part I am a routine kind of gal. I don't do well with chaos and I find that if I start my day off right it tends to run pretty smooth. For the most part it just seems to flow right along. I don't want anyone to see my routine and think that I have it all figured out and the things are running smoothly here. Not so! Some days getting the daily chore done is hard and sometimes it is just one of those days. On those days nothing but the essentials seems to get done! Having a routine not only helps me but it also helps Megan. So many times she will say Caillou then lunch then rest. Right Mama? When she know what is happening next and what is expected there seem to be less behavior issues and melt downs. I try not look at this as a schedule but as a guide for our mornings. I find it fun to see other routines. It sometimes helps me to improve mine. Stop by and visit Monica to see some other routines. Megan and I made a wreath for her grandma Thanksgiving of 2008. Since that time it has been a request of my mother-in-law that we provide her with a homemade wreath for each season. 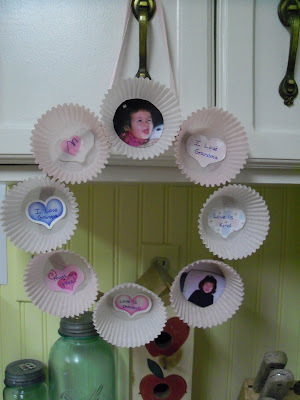 After seeing Valentine cards by Matthew Mead in Better Homes & Garden this idea was born. This is what is needed to make this. 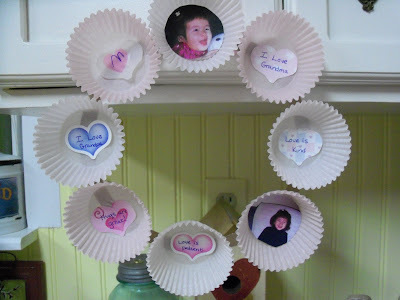 I choose a few pictures for Megan to pick from and then decided to add hearts to the other cups. 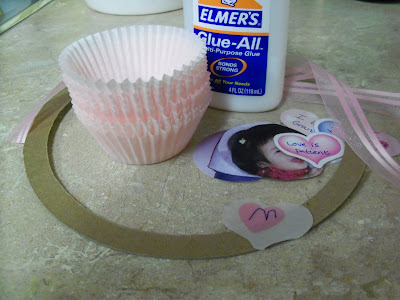 I cut the hearts out of scrapbook paper and wrote on the hearts to have the appearance of conversation hearts. Some of the things writen; I love Grandma, I love Grandpa, Hugs are Great!, verses from 1 Corinthians 13:4-6 and then Megan wrote her M on one. 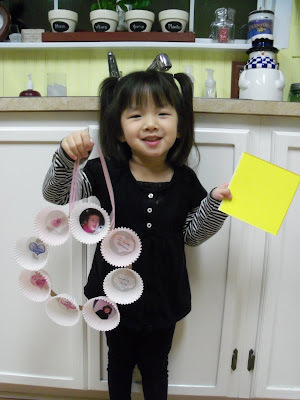 Megan then choose what she wanted to glue into each cup and I helped her to glue the cups onto the cardboard. A ribbon hanger was added and it was complete. I know Grandma will be thrilled and I think it turned out so cute that I might have Megan make one for home. Well, not quite. 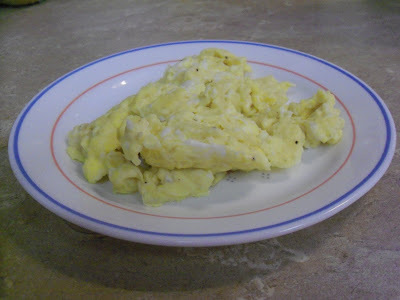 One of the things that I am changing with trying to be more healthly is breakfast. I admit that I would sometimes skip it all together or eat some overly sugary cereal. Not good. Especially since I always feel terrible about 45 minutes after I eat the sugary stuff. Here are some of the things that I have been eating. Peanut Butter Granola cereal courtesy of Mrs. U. Megan rated this as "yummy!" Baked Oatmeal. Not bad. Next time I will add some cinnamon and raisins. 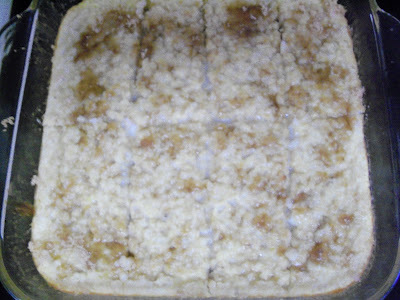 Along with a little more brown sugar on top. I have also been eating an orange. Oh, they are so good this time of year! Add in a couple varieties of toast and that is what's for breakfast. On the weekend I sometimes make a larger breakfast since the whole family is together. I would love to hear what everyone is eating for breakfast. Since last week was not the best I am happy to say that a new week is beginning. All you can do on those tough weeks is keep moving. There are many things around my home that did not get completed, but I plan to just start all over this week. It is so easy to focus on the list that when you aren't completing it you feel overwhelmed and like a complete failure. At least I sometimes do. Although I do plan on completing my housework this week I am beginning to see that is not always the most important thing. I had a great weekend and that always helps. Today I will tackle a mountain of laundry, ironing and cleaning the kitchen. When I am not doing that I will be loving on the sweet baby in my care and having some fun with Megan. Doing the things that are most important! When I read what Monica was planning for this weeks challenge I was very excited. My new goals are regarding health, heart and home. I believe that all things start with the heart. I know that I want to have a heart that is pleasing to the Lord. This was a hard week. The baby I watch is almost six months old and has not wanted to sleep. That has been challenging along with some extra babysitting duties this week. I wasn't able to do as much for this challenge as I would have liked. With my harried week I know that I needed time in His word more then ever. I am finding the best time for me to do my reading is during afternoon quiet time. Even if no one sleeps my home is quiet and I need this time to recharge. I feel like I am rushed in the morning and exhausted in the evening. I know as the season in my home changes that finding more quiet time will be easier. I am currently looking for a daily devotional to do during this time. Something that is simple. I am open to suggestions. I hope to have time to browse my local Christian bookstore this weekend. Although I didn't start a prayer journal or memorize the Psalms I am okay with that. I know that the walk I am taking is not suppose to be completed in a day or week but over my lifetime. I am starting to feel the winter blahs set in. All of our snow has melted and we have been having lots of fog. It just seems so gray and dreary. I have also been experiencing a little cabin fever. 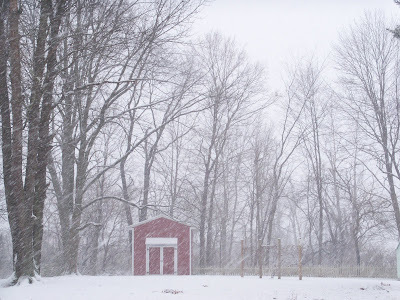 To help combat this I thought I would list some things that I find joyous about winter. 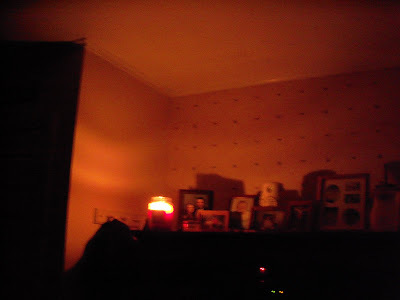 The smell of a fabulous candle and the warm glow in the evening. The beauty of fresh snow falling. 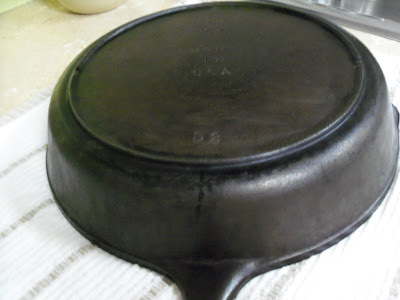 Using my iron skillet to make a warm, comforting meal. 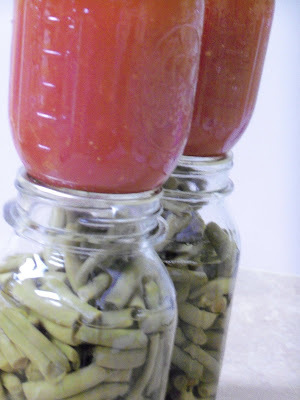 Making a meal with veggies canned fresh from my garden. The anticipation of a fresh baked muffin. I hope that you are finding ways to feel joyous about your winter days. While out running some errands I was listening to the radio. I don't know about you but sometimes the radio is on but I am not really listening. It is on more out of habit and tends to be background noise. Something caught my attention. There was a short segment about being a Proverbs 31 Woman. She was talking about how about how stressed and overwhelmed she sometimes feels. About her endless to do list and the schedule full of outside activities. About how at the end of the day or week she will feel like a failure. Sound familiar? It certainly does to me. That got me thinking about what it really means to be a Proverbs 31 women. *Pursues an ongoing, personal relationship with Jesus Christ. *Loves, honors, and greatly enriches the life of her husband, encouraging and supporting his leadership within his family and his church. *Nurtures the next generation, shaping and molding the children who will one day define who we are as a community and as a nation. *Creates a warm and loving environment for family and friends. *Is a faithful steward of the time and money God has entrusted to her. *Speaks with wisdom and faithful instruction as she encourages others and develops godly friendships. *Shares the love of Christ by extending her hands to help the poor and opening her arms to the needy. Virtues that I certainly want in my life. Living that stressed overwhelmed life is not fun. Feeling like a failure is not fun. Look for more post about this as I ponder this and what it means to my daily life. When I first read about the earthquake and how large it was I knew right away that Haiti would need all the prayers and assistance it could get. As I have watched bits and pieces on the news my heart just aches for all the Haitian people are enduring. Thankfully I have never had to live through such a a traumatic event and pray I never do. Giving has been on my heart for some time and when I saw what Crystal was proposing to do I knew I had to help. For everyone that blogs about how they are helping Crystal is going to donate $10 to Compassion International. As most of you know I do some babysitting. My long time family only use me a couple of hours here and there. When their shifts overlap. I donated half of what I made watching Connor this week to Compassion. It is only a meager $17. How I wish it could be so much more. I have found the blog community to be kind and caring. It may seem that my $17 is not much, but combine that with all the other bloggers giving $5 or $10 and I know we can make a difference. Being in day after day with the same routine can get old. I have been trying to spice things up a little for Megan. Last night I told her I was making a special snack for her. 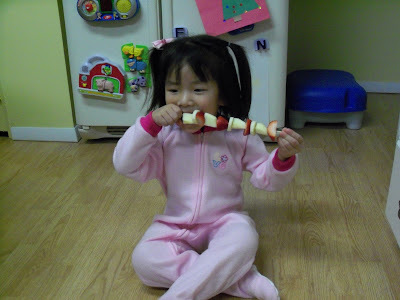 Most evenings her snack is fruit. 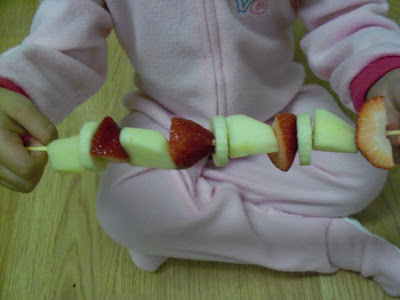 Last night I decided to dice up a variety of fresh fruit and place it on a skewer. Saying she was happy is an understatement. 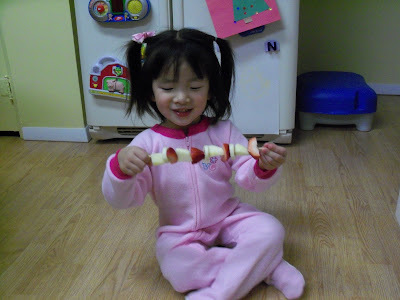 When I showed it to her she was jumping up and down and saying how much she loved her surprise snack. It made me smile to think that this simple gesture meant so much to her. What things are you doing to spice up the routine? The organizing and purging has begun! It has been on my list for a while and I just keep saying tomorrow. I will get to that tomorrow. We'll tomorrow has come. Why, the sudden urgency? I will tell you in a minute. 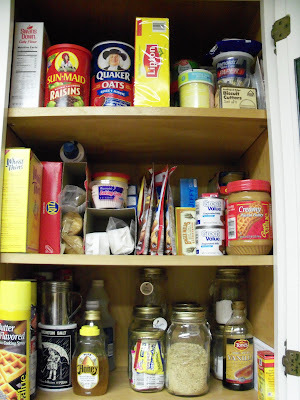 This is the cabinet where it has all begun. 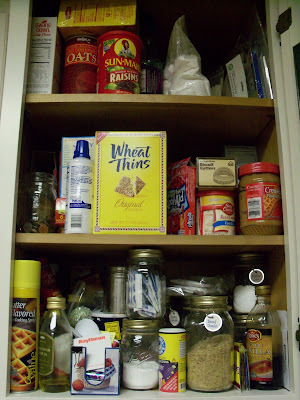 This is next to my stove and where I keep spices, baking items and our cracker stash. It was stuffed so full that when I reached for something that things were literary falling out! While reaching for some baking soda a jar fell out and hit my stove. 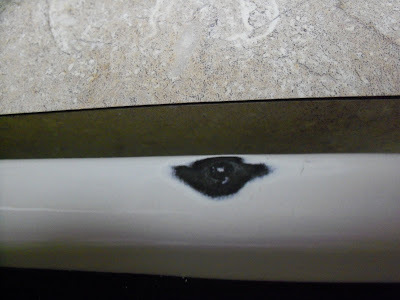 Not only hitting it, but damaging it. I was unhappy, but had no one to blame but myself. I was just grateful that it hit the side and not the glass stovetop. This cabinet is now clean, organized and looking fresh. Next on my list is the cabinet holding my cookbooks and recipe binder. I also wanted to say a huge thank you to everyone for all of the birthday wishes. I have to fess up and say that I didn't so good at sticking to my menu last week. We ended up eating out two nights and at my parent's one night. 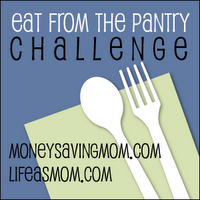 Our eat out budget is separate from our grocery money so no budget was blown. 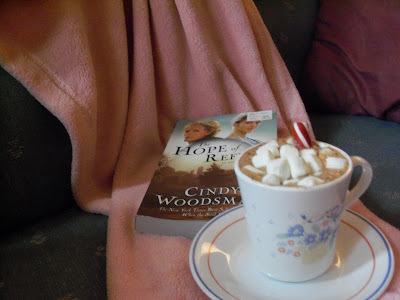 Sunday evening was spent under a warm blanket, reading a good book, The Hope of Refuge by Cindy Woodsmall, and enjoying a cup of Peppermint Hot Chocolate. A cozy way to spend a cold winter's night. 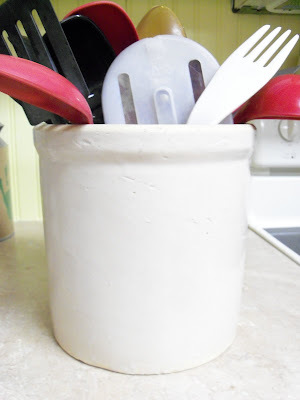 I have been wanting one to hold my cooking utensils for a long time. 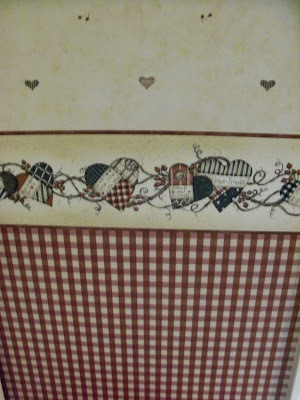 I like that this is from a local antique store and you can see that it has been used and loved. This wasn't on my want list, but it is certainly something that I love. 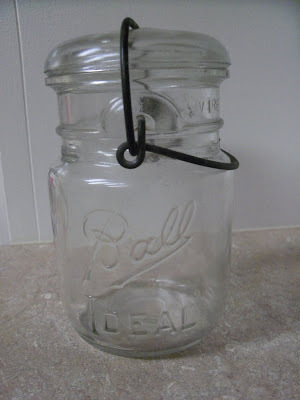 I heart any type of Mason jar. I plan to add a votive with a candle to the inside and then surround it with berries or something seasonal. I just haven't taken the time to go to the craft store. I hope to find a spot for this in the living room. 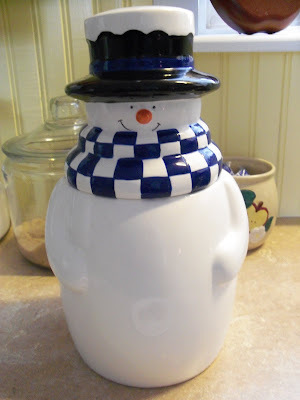 While putting Christmas things away Megan found my snowman cookie jar. When you take the top off and turn it upside down it plays Frosty the Snowman. She was super excited. Since we are entering the frostiest days of the year we keep it out. 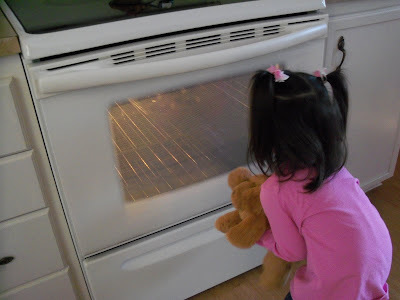 Since then Megan has been begging to make cookies and fill up Frosty. 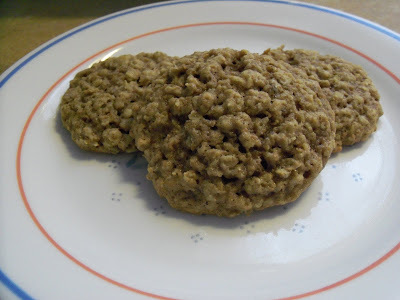 Yesterday afternoon we made a match of Whole Wheat Oatmeal Cookies. Cream 2 sticks of butter, 1 cup brown sugar and 1/2 cup of sugar. 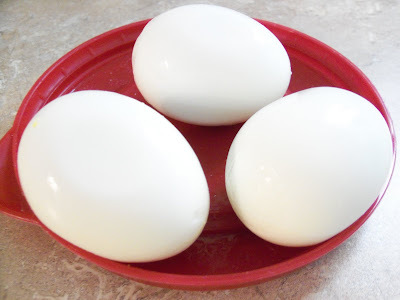 Add 2 eggs and 1 tsp vanilla. Mix together 1 1/2 cups whole wheat flour, 1 tsp baking soda, 1 tsp cinnamon, 1/2 tsp salt. Add to butter mixture. 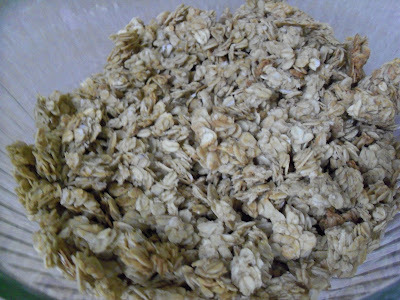 Once mixed add 3 cups of quick oats. If desired you could add 1 cup raisins, chocolate chips, dried cranberries. Really anything you want. Bake at 350* for 10-12 minutes. I have been searching the net for a healthier version of these cookies. If anyone has a healthier tried and true recipe I would love to give it a try. Also, has any baked with the I Can't Believe It's Not Butter sticks? While Chuck was on vacation we started a couple of projects. Unfortunately we were unable to get them completed, but they are close. 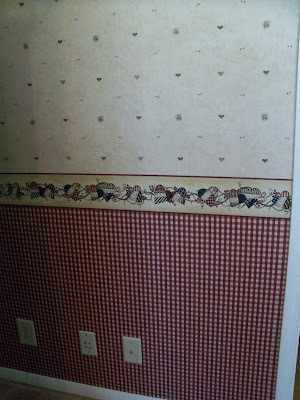 We are putting up wallpaper in the living room. My sister gave me this for Christmas a couple of years ago and I am finally getting it done. We have one wall completely done and then about half of the upper walls complete. I am so happy with the way it has turned out. I plan to take my time adding the stuff back in. Eliminating some things and doing some makeovers. I will sure to share as I go along. The next thing that was worked on was the hall ceiling. There was enough of the bead board left over from the kitchen to complete this project. 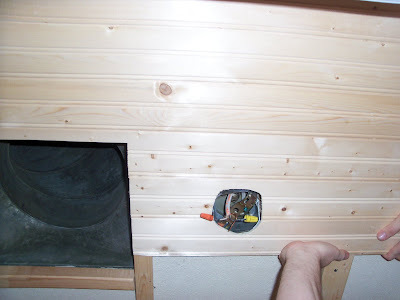 It needs one more coat of paint and then the light and vent cover put back up. The plan for the weekend to get these project complete. Is it just me or do the rest of you feel the need to decorate and teak things during the winter months? I have been watching the post about this challenge. I was intrigued from the start, but wasn't sure if it was something I wanted to do. The more I thought about it the more I knew I wanted to do this. I am one that keeps a well stocked freezer and pantry. When I find a good deal on staples I stock up. With a goal to change the way I eat and feed my family I thought this would be a great time to use up what we have, donate some items that will no longer fit into our new style of eating and to give us somewhat of a fresh start. Sunday we had dinner out for my niece, Lauren's 8th birthday and then last night we ate at my mother-in-law's. Here is my menu from tonight through Saturday. I know that I will need to make a trip to grocery for milk and fresh produce. It is those little trips and asking hubby to stop by the store to pick up an item that tend to blow my grocery budget. I am looking forward to cleaning out some things and only buying those things that are a necessity. As much as I love Christmas and all of the festivities I am happy when things start to settle back into our simple routine. I am not one to make resolutions, but I do like to step back from time to time to examine my life. I have decided that the areas I want to improve the most are health, heart and home. I recently stepped on the scale and let's just say that I was not very happy. I have struggled with my weight since my mid twenties. I have had many ups and downs along the way. Diets just don't work for me. I find that I can stick to it and lose weight, but then I usually pick it back up and then some. So going on a diet is not the plan to solve this. Getting healthy is. Changing the way we eat and adding that much dreaded exercise. This is not so much about losing weight as it will be changing our lifestyle. I know that it won't be easy, but I think if I take baby steps and change a little at a time I can do this. As far as my heart, I want my thoughts and actions to be pleasing to the Lord. I think that we have a choice about how we are perceived and the way we perceive life. I can get up each day and be thankful no matter what or I can get up and decide to grumble about things. I want a joyful, contented heart. I plan to do this by spending more time reading the Bible, surrounding myself by those that are positive and making a conscience choice about the things I do and say. Home... that is where the heart is. At least it should be. I have been thinking about the need for more space. Then I started asking myself do we really need more space or less things. The answer is really less things. I plan to go through and purge and organize. To change things to make my home comfortable, inviting and most of all a haven for those I love. As I work through this I will share what I am doing and how things are working out. My hope is that by posting here I can hold myself accountable to make these changes. I speak often about the desire to live a simple, fulfilling life. Desiring it is one thing, taking steps to make it happen is another. Wising you a great Monday!